Love the delphinium flower with those blue blooms? 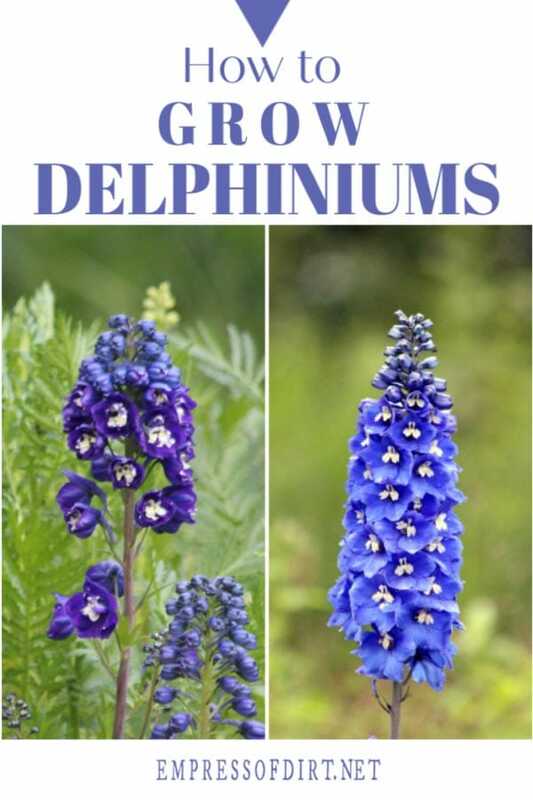 These delphinium care tips show how to grow and maintain these beautiful plants in your garden including tricks for growing them from seeds. For more, see all my plant suggestions for a cottage-style garden, and have a look around my garden here. I officially became a gardener the day I visited a local garden and saw a raised bed filled with tall, blue, gorgeous delphiniums. I just knew I wanted them in my yard (not yet a ‘garden’) and I would do whatever it took (organically speaking) to have them. They come in several colours—blues, purples, reds / pinks, yellow, white—but it was the blues that had me at hello. Since then, my repertoire has expanded to include dozens of different flowering perennials suitable for a cottage-style garden. This is part of a new series featuring the key plants in my garden that give it the casual, overflowing cottage style. I provide growing tips, plant facts, and answer some frequently asked questions helpful for growing these beauties. I find, it is worth the time to understand the history of the plant for a better understanding of the preferred growing conditions and to assess if it is a good fit for my garden. For delphiniums, they have a mountain history: originating in foothills in North America, and higher mountain regions in tropical Africa. This is why they do best in climates with four seasons: the winter chilling period is essential to trigger new growth in the spring. Here in southern Canada, they are a perfect fit. If you are in the southern United States, it may be a struggle to keep them happy. The different genus Consolida (an annual) is also commonly called ‘larkspur’. Make sure you’re buying delphiniums! This is the only example I could find on Amazon. Trivia The juice of Delphinium consolida can be mixed with alum to produce blue ink. I love this book for propagation tips for all sorts of plants. 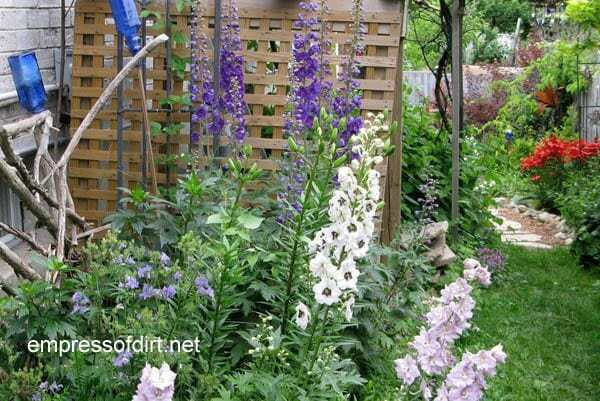 1 How do I know if I can grow delphiniums where I live? The best hint is to check if other (successful) gardeners are already growing them in your area without babying the plants. If they grow easily without special accommodations, that’s a good sign. Before proceeding, check your growing zone. Delphiniums originate as mountainous plants and do best in a climate that provides a cold (near or below freezing) winter. This helps trigger seed germination and flowering in spring. Generally speaking, delphiniums grow in zones 3a to 8b. However, each hybrid and cultivar is unique and may only be suitable for a narrower range of zones. 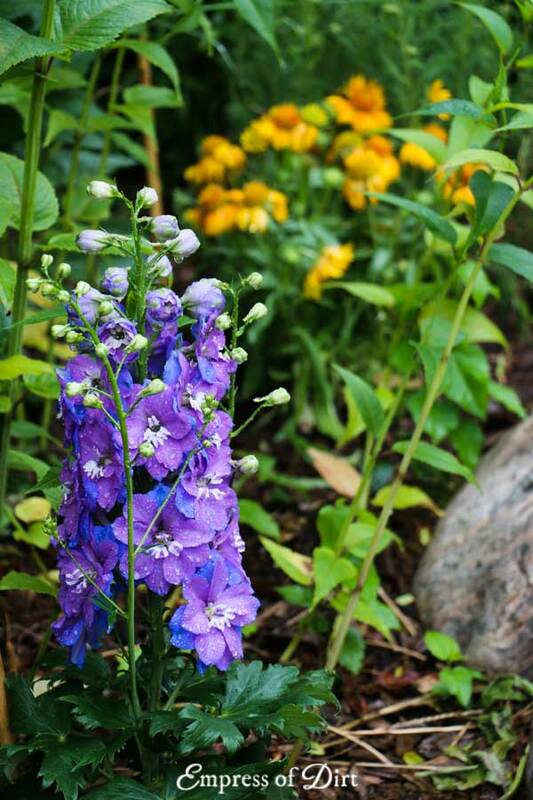 I get emails from gardeners in the southern-ish United States who struggle to keep delphiniums happy when heat is constant even though they are in zone 8 or cooler. Also, always check plant tags before purchasing plants for recommended growing conditions. A good, local garden nursery is a great resource for plant information. If they are growing and propagating the plants in your zone, be sure to ask for their best tips and plant recommendations. 2 Do delphiniums require any special care? The beauty of delphiniums is their tall stature and mass of blooms. I have the best luck when I grow delphiniums in a sheltered location (here in Ontario, Canada, zone 6b) where they are protected from strong winds. A strong wind won’t kill the plant but it can snap the flowers off, which defeats the purpose of growing them (unless you want accidentally-cut flowers). Leggy delphiniums benefit from supports. I place bamboo posts a few inches from the plant base and attach twine, loosely around the plant in a few places. This way, if the wind pushes or pulls the plant, the twine prevents it from falling right over. Because the twine is loose, it does not inhibit or interfere with the growth. When selecting plants, look for nice, thick stems. There are many beautiful delphinium cultivars, but some of them have massive flowers on rather thin stalks and these can easily fold or collapse, killing off the flowers. Tragic, really. 3 Should I fertilize my delphiniums? Many advise to use a 16-16-16 kelp and seaweed extract fertlizer because delphiniums are heavy feeders. It is recommended to wait until the plant has established good roots before fertlizing if you want to assist flowering. That said, I do not use any commercial fertilizers in my garden. You may consider this over-the-top organic growing but here’s my thinking. I grow all sorts of food crops (veggies, fruits, nuts) as well as ornamental plants in containers and the ground. I want to be able to freely use my soil and container mixes without ever having to worry that there is something in there that is not safe for food crops (because it could be absorbed by the plant), or because it is considered hazardous in the soil (potentially harmful to microbes, insects, or other life in the garden). Going fertilizer-free (and pesticide/herbacide-free) removes much of this worry. So, how do my delphiniums grow so nicely? I choose good plants, with strong, thick stalks. My sandy soil is constantly amended with compost from my food scraps and covered in organic mulch (usually wood chips). I also plant everything closely together to prevent weed growth and shade the roots, which keeps more moisture in. 4 Can I grow delphiniums in containers? Yes. You will need proper container mix made for flowering perennials. You may need to use fertilizer or replace most of the container mix each year to ensure the plant has what it needs to grow and bloom. And, you will need to ‘over-winter’ the container. This means moving it to a protected location during the winter. This post on over-wintering fig trees outlines the steps. 5 What is the best way to start new delphinium plants? If you want to propagate new plants from existing ones, the fastest way is to divide a large (mature) plant by digging it up and splitting the root ball in two (or more pieces). Another method is to take ‘basal’ root cuttings in spring. This involves partially digging up the plant and taking a section of the roots for propagating in a container. There’s a specific window of time for this which I famously forget about each spring. For germination by seed, in autumn, toss some seeds in your garden bed, cover them lightly with soil, mark the spot, and leave them to germinate in spring. 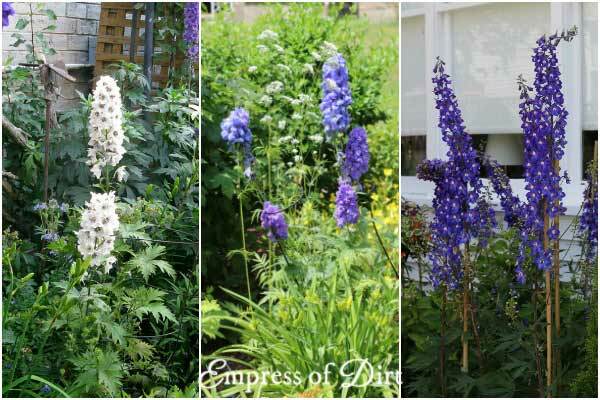 This article shares more info on propagating delphiniums. If you plan to grow from seeds indoor, see this tip for getting delphinium seeds to sprout faster. 6 How can I get a full-season of blooms from delphiniums? The trick is to cut them back after first flowering. When the late spring flowers have started to fade, trim most of the flower stalks down to the ground, leaving the surrounding growth. You should get a second set of flowers before fall frosts set in. You can read more about this method here. 7 My garden is windy. Is there a way to grow delphiniums without the wind breaking them? Yes. There are some dwarf varieties with nice thick stems and dense flower heads. Look for the Delphinium Blue Fountains Group. They are one of my top favourites with their gorgeous blue colours. I hope you find this helpful, and, if you have any questions let me know. My beautiful delphiniums have that fungus thing that turns the leaves black and they shrivel up and die. Help! I have tried Safers fungicide spray and I have tried removing the infected leaves but it just keeps happening! Please don’t tell me to burn the plants and remove the soil around them… I couldn’t bear it! Thank you Melissa for such a detailed information. 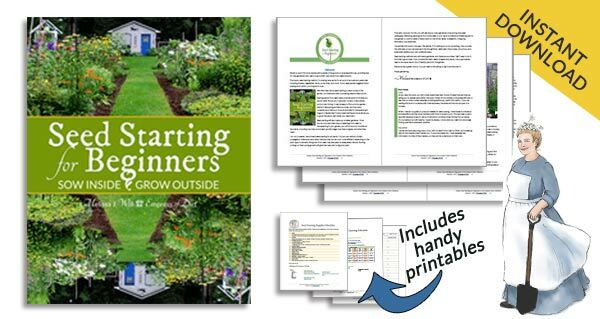 I am in zone 3, and just ordered New Millennium Mini Stars seeds from New Zeland. Planning to grow them in pots. Do tou suggest planting them this year still or i would be better off next spring? Would appreciate your help. Thank you! I would probably start them indoors asap (after chilling) and transplant them into the garden before fall. By the way i am in zone 3, Alaska. I will start them indoors just like you suggested after refrigerate presoaking them for 3 days. Thank you so much for the article chock full of information on Delphiniums. I’ve tried to grow them in our backyard where we get full sun. They started out looking good this spring. Come summer…they faded quick. I’m going to give them another try next spring in our front flowerbeds where they will get part sun and part shade. They are so beautiful…love the colors. Good morning Melissa. 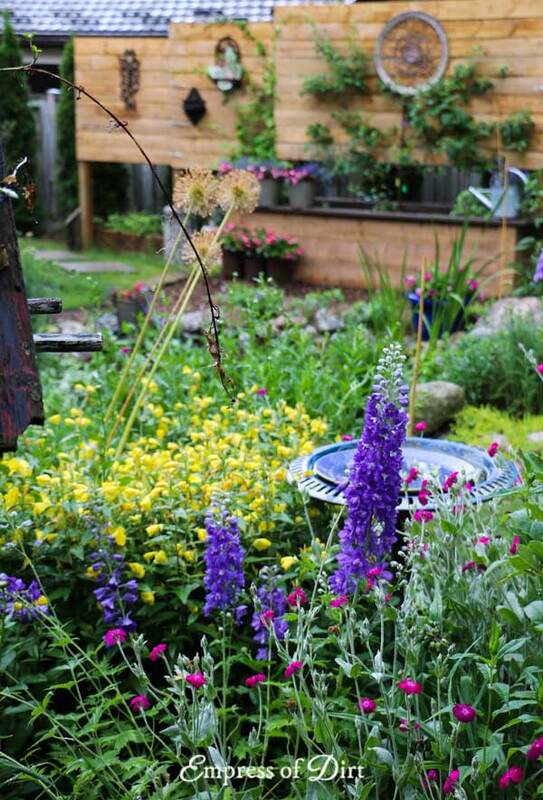 What is the yellow flower behind the delphinium above and next to the birdbath? I love it. My delphiniums are struggling this year due to extra hot sun on the south side of my house.